Transforming lives by educating for the best. The basic vision of the University is to make the Cagayan State University as a catalyst of change in improving the lives of individuals and communities by educating for the best. The one-liner vision succinctly captures the profound meaning and ultimate purpose of the collective efforts and educational directions of the university. 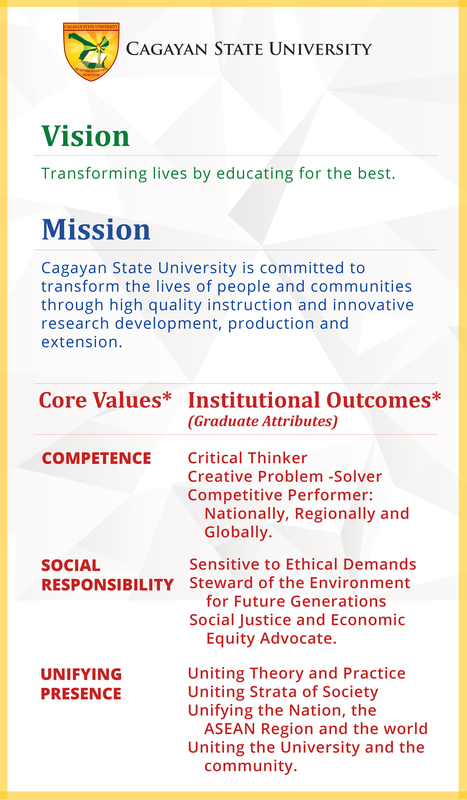 Cagayan State University is committed to transform the lives of people and communities through high quality instruction and innovative research, development, production and extension. The Cagayan State University, a credible and distinguished center of higher education in Northern Luzon, is committed to improve the lives of people and communities by providing advanced instruction in the arts, agriculture, and natural sciences as well as in technological and professional fields through its strong quality of instruction and innovations in research, resource mobilization and extension. CSU contributes primarily to President Aquino's Social Contract to the Filipino people by providing quality education and training through instruction, research, extension and production. Competitive Performer: Nationally, Regionally and Globally. Social Justice and Economic Equity Advocate. Uniting the University and the community.